Try topping soup with a dollop of sour cream and chopped tomatoes. This soup is also good if a potato, another carrot, and celery are added. Eliminate the chilies and cumin if you do not want the Mexican flavors. In a large saucepan, sauté the onion in vegetable oil over medium high heat (350 degrees in an electric skillet). Add lentils, water, salt, pepper, cumin, thyme or oregano and bay leaves. Bring to a boil. Lower the heat to medium low (250 degrees in an electric skillet). Cover and simmer for 30 minutes, stirring occasionally. Add the green chilies, red bell pepper and carrots. Simmer 15 more minutes or until the lentils are very soft. Before serving, remove and discard the bay leaves and stir in the lime juice. Serve hot. 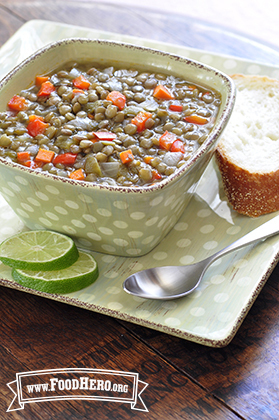 2 Comments for "Lentil Soup with Lime Juice"
SO yummy! My family, including 2 year old, loved it! Topped with tomatoes, avocado and nonfat yogurt! Will make this again. Yummy yummy!!! This was my favorite! I will definitely make this again!